News Photo by James Andersen Alpena’s Colby Plowman, front, tries to poke the puck past Traverse City West goaltender Max Grigsby (33) during the first period of a hockey game on Saturday at Northern Lights Arena. 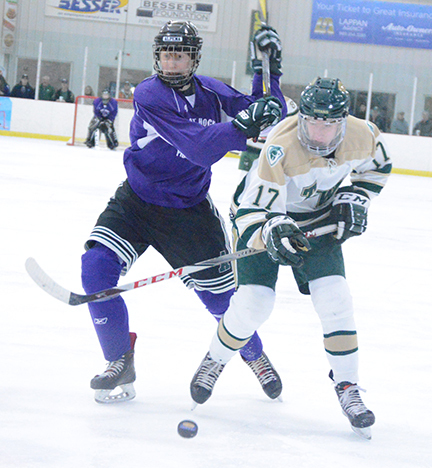 Colby Plowman’s timely goal and big night overall put the Alpena High School hockey team right where it wants to be. Plowman scored four goals and added an assist as the Wildcats defeated Traverse City West 5-2 on Saturday at Northern Lights Arena. With the win, the Wildcats (16-4-1 overall) take over first place in the Big North Conference with a 5-1 record. None of Plowman’s goals was bigger than the one he scored with 21 seconds left in the second period to give Alpena a 3-2 lead. After being denied on a chance about a minute earlier, Plowman scored to compete a natural hat trick after beating West goaltender Max Grigsby top shelf with a backhand. The goal came just seven seconds after West scored to tie the game 2-2 and it gave the Wildcats the boost they needed to close out the game. News Photo by James Andersen Colby Plowman (3) is congratulated by teammate Owen Limback after scoring in the first period. Plowman finished the game with four goals and an assist as Alpena defeated the Titans 5-2. During the penalty-filled second and third periods, the Wildcats were strong on the penalty kill and pulled away from West with a pair of third period goals. Playing in front of a big crowd (official attendance was 630) during their annual Purple Game, the Wildcats built a 2-0 lead early and ultimately finished the game strong. The Wildcats’ top line of Plowman, Kyle VanDusen and Brett Ciupka–accounted for nine points. Ciupka gave Alpena a 4-2 lead with 4:23 to play when he picked up a loose puck near the slot and beat Grigsby up high with a backhand. Plowman finished with four goals and an assist and VanDusen had three assists. Plowman finished off his big night by outracing a defender for the puck and tapping in an empty-net goal with 20 seconds left on an assist from Owen Limback. News Photo by James Andersen Alpena's Brett Ciupka, left, races toward the puck along with Traverse City West's Josh Reece during the first period. Alpena goaltender Cooper Black finished with 15 saves. Plowman opened the game’s scoring with a power-play tally with 6:33 left in the opening frame and VanDusen earned the assist. A few minutes later, the Wildcats were aggressive around the net and were rewarded with another goal when Plowman managed to poke the puck past Grisby with another assist from VanDusen, giving Alpena a 2-0 lead. Alpena’s penalty kill played tough early in the second period as West got a 5-on-3 advantage for 40 seconds, but couldn’t convert. During a penalty-filled second period, West got on the board with the man advantage when Andrew Rickenberg scored with an assist from Nick Beeman with 2:10 left. 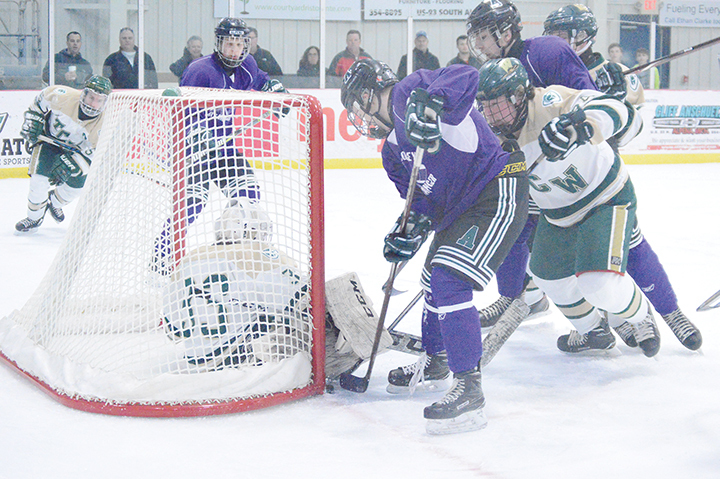 Alpena, which hasn’t surrendered more than two goals in a game for nearly a month, found itself tied with the Titans with 28 seconds left in the middle frame when Caleb Barsheff beat Black with a shot from the point. The Wildcats were frustrated by the tie, but Plowman made sure that didn’t last long as he scored what ended up being the game-winner. Alpena will host Gaylord on Monday in a continuation of a game from Jan. 18. The game was stopped midway through the second period due to poor ice conditions with Alpena holding a 3-1 lead. Puck drop is at 8:30 p.m. and the teams will play the remaining one and one-half periods. Alpena will also host Cadillac on Friday and Traverse City Central on Saturday. News Photo by James Andersen Alpena’s Brett Ciupka, left, races toward the puck along with Traverse City West’s Josh Reece during the first period.